Today I am starting a new trend here on Innovative Designs. I will be sharing some friends creations with you. My first contributer is Annette. We have been working together (nursing) for a few years now and have gotten to know each other better through our love of papercrafts. 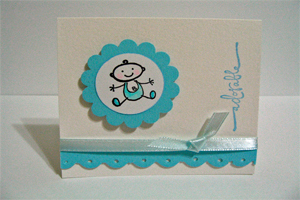 Annette is very gifted in many areas of crafting including Folk Art. 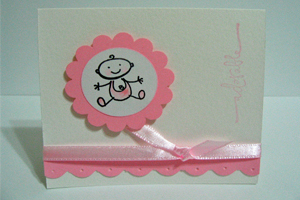 Hence card making and throwing colours together comes naturally. 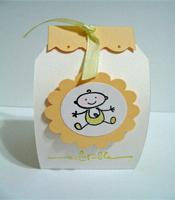 For her first contribution, I have chosen two cards and a Treat Box she has made with a baby theme. I don’t know about all of you, but I seem to know of so many people having babies this year. I am sure these projects will be very handy. I don’t know about you, but I think these projects are adorable. So thank you Annette for being my first guest blogger on Friendly Friday. I look forward to sharing more of her projects with you in the future. I will be putting up some of my latest work soon and please come back next Friday when I introduce you to another guest blogger.